Two things have to happen before I start to believe I’m working on a “real” project; I have to bleed on the stock, and there has to be one significant mistake. Otherwise it feels like I’m just playing at woodwork. Today was the day on which my Anarchist’s Tool Chest became a real project. The sharply relieved sides of Lie Neilsen chisels? Yup, they’re sharp. To the extent that the next time the cutting edge of my 1/2″ chisel becomes dull, I’m going to turn the chisel side on and pare my dovetails with that edge. Still, milk paint will cover up the trail of blood I left across the side of the case. Milk paint hides all manner of sins. The first part of the day was spent flattening and smoothing the rest of the casework. Although the No.4 and No.8 Lie Neilsen planes I had borrowed from Paul were useful for this operation, I remembered how much I love my No.9 1/2 block plane for removing tearout and achieving a finished surface. 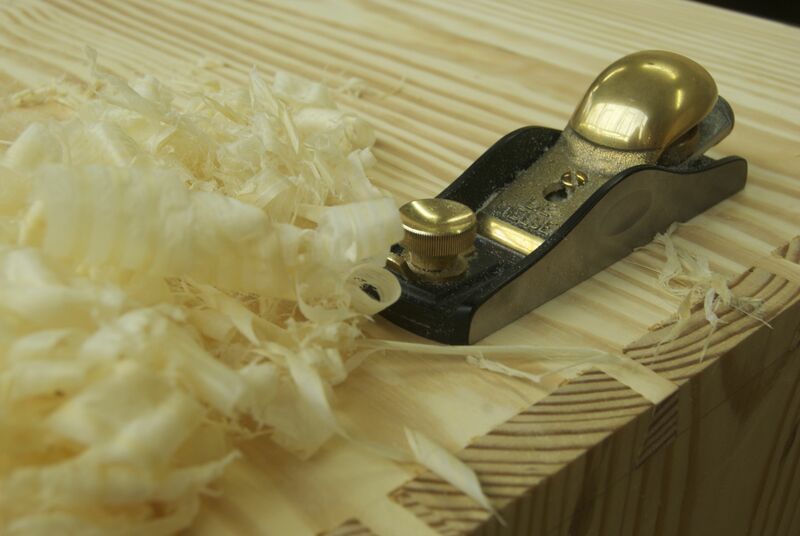 The block plane is incredibly comfortable to use for extensive periods of time, and being smaller than a smoothing plane it can work very localised areas. The interesting thing about flattening the case was the extent to which I had to switch off my luthier’s training. Because of the gnarly stock we are using, the time constraints of the course (which are increasingly constantly) and the fact that the tool chest is by necessity a rough piece of furniture which is going to get knocked about in the workshop, I had to keep reminding myself that the purpose of flatting was to achieve a surface that is flat enough to glue on the skirts, and not to achieve complete flatness in the way that you would for an acoustic guitar soundboard. And this is a universal lesson which I think can be lost in the heat of working on a project – all work is done to tolerances, but the tolerances will change with the function and nature of the project. But what of the significant mistake I mentioned earlier? It was, predictably, a result of trying to hurry too much and feeling the slowly ratcheting pressure as the course comes to an end. Having carefully dovetailed two opposite corners of the lower skirt, I marked off the correct length for the two other corners, cut to length and set to dovetailing the stock. Which was all going fine until I hogged out the tails, and not the waste, on the tail board. Clearly swapping the tails to the sides (unlike the carcass where the tails are on the front and back) had confused me. Silly boy (and again, slow is smooth and smooth is fast). Still, with able assistance from Matt of Workshop Heaven (who was visiting the workshop) I was able to replace the ruined board. And you know what? I’m not going to beat myself up about this mistake. They happen, even to the best woodworkers. And with the pressure to stick to the schedule mounting, most people in the class are starting to slip in a couple of mistakes here and there. It’s all part of the learning curve. And as important as it is to learn from the mistakes, success must also be celebrated. Somehow this week I appear to not have goofed half as much as I expected to in front of Mr Schwarz. Getting starstruck is a terrible curse, and there are times in the past when I have been reduced to a gibbering wreck upon meeting my heroes (I still have nightmares about the time I asked HHJ Humphrey Lloyd QC to be my dad, seriously not cool). But either I’m more coherent than I exected, or Chris is used to fanboyish behaviour. Either way, I’m chalking this one up as a win. Tomorrow I will glue the skirts to the case, nail on the bottom boards, and build the lid. So plenty to get done, but we’re almost at the finish line. This entry was posted in Anarchist's Tool Chest, Furniture Making and tagged chris schwarz by overthewireless. Bookmark the permalink.